Did you know that nearly one in three Americans suffers from dental anxiety? If the idea of visiting your dentist’s office makes you break out in a sweat, then our experienced sedation dentist in Moorpark, CA, can help. Our dental team understands your fears, and we will gladly work with you to ensure that your visit is relaxing and pain-free. We want your visit to our office to be stress-free, so you can receive the oral health care you need. 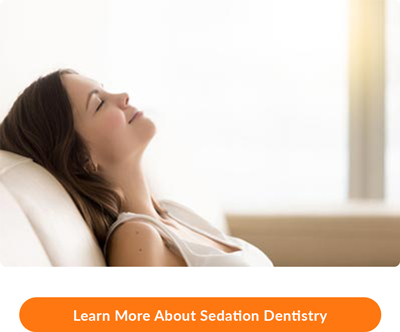 We proudly offer three levels of sedation – mild, moderate, and deep – that are dispensed either orally or through inhalation. Our dentist will discuss your options and provide his recommendation based on the results of your initial exam. Whichever option you choose, once your procedure begins, our experienced clinical team will make sure you are comfortable and safe throughout the entire procedure. Your happiness and health are our top priorities! Moorpark Center for Dentistry is pleased to offer 5-star-rated dental care including sedation options for your maximum comfort. For more information, simply call our friendly office today at 805.243.3999 to speak with one of our team members. If you’re ready to schedule your complimentary Moorpark Center for Dentistry New Patient Exam, you may call us at the above number or click here to use our convenient online form. We can’t wait to help you achieve your best smile!